The Allen Brain Observatory presents its inaugural dataset, allowing for quantitative exploration of the functional properties that underlie coding of sensory stimuli through the visual pathway, at both the single-cell and population levels. The characterization of visually evoked cellular responses is carried out using in vivo calcium imaging from GCaMP6-expressing neurons measured from selected brain areas, cortical layers, and Cre lines. The cellular responses acquired during the presentation of the static grating stimulus provide data to help characterize visual tuning properties of cells, such as the spatial frequency tuning and the orientation tuning of the cells, providing a finer measurement of orientation than provided from the drifting grating stimulus. The static grating stimulus consists of a full field sinusoidal grating, that varies in orientation (the angle of the grating), spatial frequency (the width of the grating), and phase (the position of the grating). In this dataset, 6 orientations (at 30° intervals), 5 spatial frequencies (0.02 — 0.32 cycles/°), and 4 phases are used resulting in a total of 120 stimulus conditions. Each grating is presented briefly (250 ms) before being replaced with a different orientation, spatial frequency and phase condition. Each condition is presented 50 times, in random order, with intermittent blank sweeps. Capturing the responses to all 120 static grating conditions has up to this point required several figures. Two-dimensional heatmaps can capture the orientation and spatial frequency tuning for each phase. Alternately, the spatial frequency tuning can be plotted at the preferred orientation for each phase, or reciprocally, the orientation tuning can be plotted at the preferred spatial frequency, also at each phase. To capture the cellular responses of all these conditions in a single figure, the cellular responses to each static grating are being represented using the "Fan" plot. 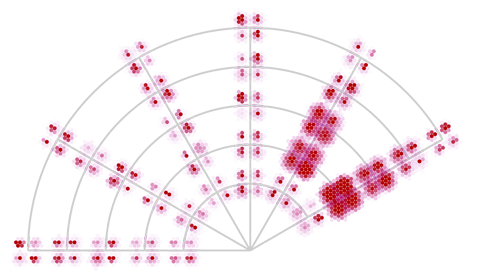 Each arm represents the orientation of the grating, while each arc represents a spatial frequency with the lowest frequency near the center of the plot and higher frequencies radiating outward. At the intersections of these axes are four lobes, each corresponding to a different phase. Each dot represents the response to a single trial of that grating condition, the color and intensity corresponding to the strength of the response. In this way, the rank-ordered dots capture both the strength and the trial-to-trial variability of the cells response to each condition.